Equities start the day higher because it’s St Patty’s Day! Honestly, is there a better random holiday than St Patty’s Day? God truly favors the Irish, they are just the nicest people on the planet. So in honor of St Patty’s being such an awesome day we are going full on positive in the recap. Nothing but good news, green faces, amazing accents, and a really mediocre beer that for some reason is insanely popular (im sorry, but Guinness is not good). The S&P sits at 2,025, up 10% from the lows, so let’s talk about all the good things that are currently happening. 1) Oil looks to have bottomed. It bottomed when we saw an inventory number that looked like the number of stars in the sky yet the thing closed HIGHER on the day (Mar 2). It bottomed when companies like MRO and WFT issued tons of shares and closed HIGHER. It bottomed when people started calling for $20 oil. 2) The “Industrial Recession” may have been tamer than we originally thought. Take a look at the chart of FAST (we rate neutral), this thing is HYPER sensitive to Industrial trends and look at what it’s done over the past month. 3) Regional manufacturing indices are bouncing. 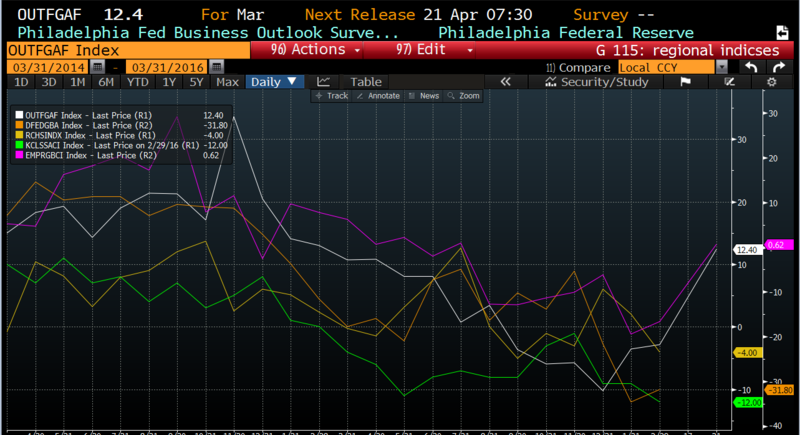 Empire and Philly Fed are back in positive territory. 4) Homes are still a “we’re sailing between the 40th and 50th parallel” tail wind for the economy. There are nowhere near enough new homes. 5) USD has started to weaken as well, it’s had a nice pullback from the highs. Does this have the potential to boost EPS? Sure, if it continues, but the jury is still out on that. The Dollar moves like a supertanker so let’s not get crazy here. That being said, suddenly $120 might be low for 2016 SPX earnings especially if CFO’s stop saying “oh man this dollar is killing us” 6) Have you seen the Transports lately? FDX reported last night and things aren’t so bad my friends. So there we have it, maybe all the doom and gloom was overdone? Maybe we should’ve looked to the Irish for their innate joy of the world instead of trolling thru endless apocalyptic blogs? God I love St Patty’s day, especially when the NCAA Tournament starts at the same time! After the open it was up and to the right…AGAIN. The low was made a whopping 30 minutes into the session and by lunch you woulda thought our economy was growing at 5% with 1.5% unemployment and the Cubs in the World Series. Let’s talk CAT for a second. Now cats are stupid and no one should own them as a pet but CAT the stock…check out this move after the company LOWERED its quarterly guidance. You know what the hardest lesson to learn in stock trading is? Other than beating the VWAP? That news isn’t what’s important, it’s the REACTION to the news that matters. CAT has been one of these “the world is a mess, China is a mess, no one wants tractors” trades for the longest time (we rate outperf). When a company lowers its guidance and the stock rips….well that’s what we call “priced in”. It’s the same thing for FAST and Oil and all that stuff I mentioned in the first paragraph: apparently the market was way too bearish on EVERYTHING. Would FDX stock do this if we were on the verge of a worldwide recession? (we rate outperf) Other winners today: CHK, FCX, EMR, DVN, and DO. Losers: ENDP, LLY, CMG, MNK, and ISRG. Let us also look at the chart of IBB, a once proud franchise succumbing to endless rotation. By lunch the S&P was only down 0.09%...for the YEAR. Epic comeback from the recession of 2016, which I think lasted about a week. The rest of the day was more of the same, up and up until we stalled near the finish. We didn’t manage to recover green numbers YTD but we are tantalizingly close so we may as well call it what is: still a bull market. Ok, there, I’ve had my mea culpa so I’m going to stop beating myself up over it. The economy is still muddling along, the Fed has told us that “2 hikes instead of 4 sounds about right”, and price action continues to show that everyone is off sides so let’s put these recession worries on the back burner. In order for this to truly be a bear market we’d have to see 1,700 before 2,130, and we closed today at 2,040. Ummmm, yea. So either the market rallies 4% and validates the Bull or drops 17% and creates the Bear. Which do you think happens first? Final Score: Dow +90bps, S&P500 +66bps, Nasdaq +23bps, Rus2k +155bps, and TRANSPORTS CLOSED ABOVE THEIR 200 DAY FOR THE FIRST TIME SINCE MAY OF 2015. Since it’s the Tournament and St Patty’s Day and no one is reading this we are moving on to the big finish! Both of my final links are somewhat inspired by St Patty’s Day so buckle up! The first link is a grumpy old Irishman giving his opinion of St Patty’s Day with endless Americans milling about. The second is what happens when you drink endless beers. Fail time!! !